Our mission statement is both simple and unique: Paradise Hills Ranch is dedicated to high-quality registered Quarter Horses using Natural Horsemanship methods. We offer recreational horse lovers of all levels and experience the opportunity to truly enjoy sound, and safe horses. Paradise Hills Ranch specializes in Registered Quarter Horses because they are the most versatile of all breeds. We personally selected sound horses for not only their conformation but also their disposition. The majority of our horses are enrolled in the NAERIC incentive program. For more information about this program, click here. The horses came to Larry and Leslie Stewart as "untouched" yearlings with minimal contact with humans. The horses now roam the ranch's 529 acres and have become familiar with rocks, boulders, creeks, fallen trees and other obstacles they are likely to encounter later during recreational riding. Natural Horsemanship education at Paradise Hills Ranch is a patient process inspired by the methods of Natural Horsemanship masters such as Pat Parelli and Ronnie Willis whom Larry Stewart spent over 14 years with. Taking a positive and respectful approach and never jeopardizing the dignity of the horse, we gradually build trust and free the horse to be confident in all they are asked to perform. By replicating the instinctive "language" horses use to communicate with each other to establish dominance and friendship, an effective method of communication "language" with humans begins. When PHR horses are offered for sale, they are sensitive, responsive and ready to build a meaningful partnership with you and are able to perform everything that corresponds with their stated level of development. Each horse is evaluated in the arena and on trails, both alone and in groups and he must meet numerous benchmarks for skill and behaviour. The result of this patient, natural training process is a great horse. 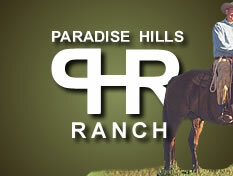 Paradise Hills Ranch horses make wonderful partners for the recreational rider. If you are interested in finding your dream partner, please contact us. Because we take great care in matching the rider with the right horse, we'll interview you about what you are looking for in a horse, your riding level and activities and other related information. From here, we'll choose a small group of "match" horses that we believe to be good prospects to become your dream partner. We then invite you to come to the ranch to meet your "match" horses. We will demonstrate each horse for you and you will be able to try each horse out for yourself, both in the arena and out on the trails. We find that the choice often becomes obvious and frequently, it is the horse that does the choosing. Sounds too good to be true! Well, it isn't. Choose from over 100 head of horses from registered Quarters, paints, warmbloods and even a mule. If we don't have a horse already trained, come pick one out and let us custom train your horse especially for you. We post new horses often as they finish their training program and are ready for sale. Because we have so many horses, some of them are not listed on the website yet but may have similar breeding as others that are listed. If you don't see what you are looking for, please contact us for more details.